Affiliations: University of Rome La Sapienza, Chemical Research 2000 S.r.l. Abstract: The assessment of organic and inorganic pollution in agricultural soils is a difficult challenge due to the large area used to collect and analyse a lot of samples. The measurement of inorganic compound, such as heavy metals, can be obtained by analytical techniques for on-site screening and fast analysis of metals in soils and sediments like Field portable X-ray fluorescence (FPXRF) spectrometry. This method is no destructive and allows a rapid qualitative pollution characterization, allowing to identify the hot spots where to extract the soil samples to be analysed in the laboratory by traditional techniques. However, a fast and low-cost method to measure organic compounds, such as dioxins and PCBs, in alternative to laboratory techniques actually doesn’t exist. 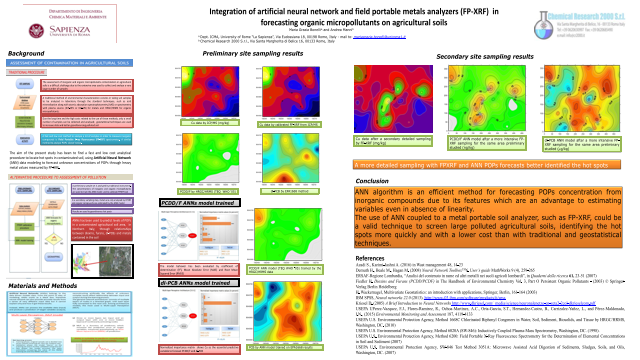 The aim of the present study has been to find a method able to screening the pollution of an agricultural land, using a Field Portable X-ray fluorescence to measure metals value and a statistical procedure, such as the Artificial Neural Networks technique, to estimate unknown concentrations of dioxins and PCBs trough the relationships between the organic and inorganic pollutants. Summary: ANN algorithm is an efficient method for forecasting POPs concentration from inorganic compounds due its features which is an advantage to estimate variables also in absence of linearity. The use of ANN coupled to a metal portable soil analyser, such as FPXRF could be a valid technique to screen large polluted agricultural soils, identifying the hot spots more quickly and cheap than with traditional and geo-statistical techniques.